Captain Amalo, a Brazilian pilot has succeeded in grabbing the attention of Arab Media by accepting Islam during his flight. He made to the headlines when he was flying high at 18000 ft. above the ground of Tabuk, Saudi Arabia and took a short break from navigating a passenger plane for this purpose. The inspirational episode took place in the boundaries of Tabuk, Saudi Arabia when a pilot while performing his professional duties entered in the religion of Islam. The video was also made covering the entire incident and it got thousands of re-tweets and likes on social media. Viral Video: The video capturing the aviator conversion has been viewed more than 20,000 times and have been covered at the various news outlets. The video clearly shows the pilot reciting the Shahadah which is the most important declaration that every Muslim must make when he is accepting Islam. Once these words are said by a person he enters in the boundary of Islam and thus considers himself to be obeying all the rules and regulations and orders given by Allah to spend his life. According to EL Balad news, the footage that showed the pilot accepting Islam by taking Islamic oath was made in the cockpit when the plane was approximately 18000 ft. in the air. How did it happen? 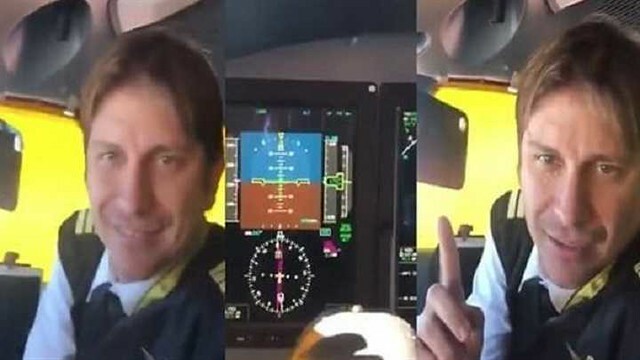 The video has shown that in the start the first pilot explained in Arabic that they currently flying in the Tabuk region in Saudi Arabia and further added that his Brazilian co-pilot Captain Amari will be giving the Shahadah. The first pilot then started reciting the Shahadah while the co-pilot kept on repeating it word by word while he was looking into the camera. Once the Brazilian pilot finished reciting the Shahadah the first pilot congratulated him and called him “My Brother in Islam” to which the Brazilian pilot responded in the same words of “My Brother in Islam”. Islam is the religion of peace and serenity and there are millions of examples where people from different religions after getting inspired from the teachings of Islam and the conduct which our Holy Prophet (PBUH) has carried in His life, entered Islam and accepted the Oneness of Allah. The happening of this wonderful thing, especially in the country like Saudi Arabia, is indeed a pleasant thing because Saudi Arabia holds a very sacred position in the hearts of all Muslims and there are always many sacred sentiments attached to this land.